VandeGrijp specializes in the production of steel pipes, piles and custom constructions. We also rent piping systems and floating structures for onshore and offshore industry. From two Dutch companies we serve the international market. VandeGrijp is active in the offshore, marine industry, oil and gas, wind energy, engineering. VandeGrijp specializes in the production of steel pipes, piles and custom constructions. We also rent pipeline systems and floating structures for onshore and offshore industry. We serve the international market with two Dutch companies. 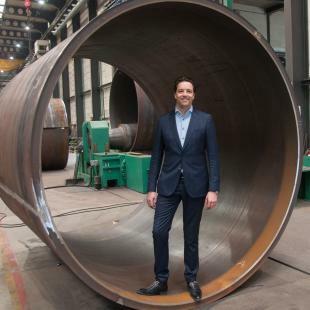 VandeGrijp is specialized in production of steel tubes, piles and tubular constructions made to design. Apart from production, VandeGrijp rents flanged pipelines and floating equipment for the on- and offshore industry. VandeGrijp Group comprises two entities to serve our customers with rental or custom production. Headquarters and production are conveniently located close to major highways and with direct access to Rotterdam and Antwerp Harbors via water. VandeGrijp IGS is the production entity and excels in heavy steel constructions. We manufacture tubes, tube sections, cylinders, cones and half scales to order. However, we also produce complete winch drums, transitions and spreader bars. With more than 8,000 m2 of fabrication halls, our own harbor with roll-on roll-off quay at our property of more than eight hectares, we can help you fabricate virtually anything. Whether it is a unique special item, or large serial pipe production, in high tensile or normal steel, we deliver on time. VandeGrijp Rental offers customized pipelines and equipment for infrastructure projects. With more than 60 kilometers of flanged pipes in stock and a fleet of pontoons, split hopper and hopper barges available, we are confident to offer you a fitting solution to a temporary problem. Do you have questions, or would you like to be contacted by one of our associates? Please leave your phone number and indicate the time and date you would prefer to be contacted.